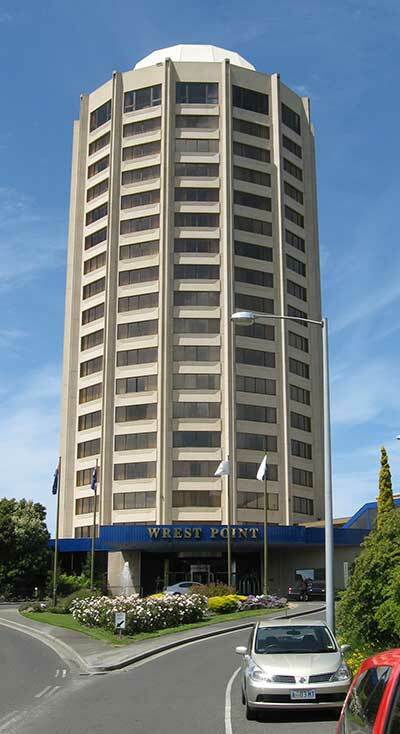 Wrest Point is the location of Australia's first casino. Wrest Point certainly is. And it's a good thing too. Because the casino scene is not my scene. Don't get me wrong - I love having a sticky beak in a casino. I've been to casinos in Vegas, Monaco, Sydney, Melbourne. But for some reason I've never been tempted to part with large sums of money. I'll admit to being relieved of some loose change - but that's it. What fascinates me about casinos is all the stuff around the gambling areas. The bars, restaurants, non-stop shows, theatre. Now those are my drawcards. I guess it's no accident that casinos come with these. Casinos want to attract you there, and keep you there if possible. So if gambling ain't your thing, to start with at least, there's always another way to get you to stay! So what have we got at Wrest Point? And of course there's more. I'm guessing you are not expecting me to explain the rules of these games. Good because I wouldn't know! There are rooms with harbour views, city views and mountain views. Rooms are rated from 3.5 star to 4.5 star. There are rooms to suit families, the business traveller or those on holiday. There are wheelchair accessible rooms too. There is even a skin care centre on site. You have plenty to choose from. There are about five dining venues and six bars, some located within the dining venues. Whether it's a quick snack you're after, or a light meal, or a leisurely dinner, you should find something to suit. Maybe the revolving restaurant? Check the Wrest Point website for information on shows and special events, such as Girls Day Out. Need help with car rental and tours? It's all here too. I didn't stay long at my visit. I just wanted to check the place out. Maybe I can score the record for most casino visits and least money gambled away!